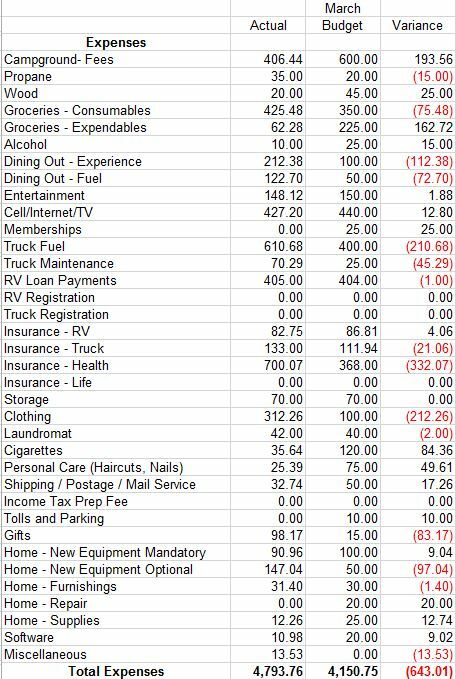 This entry was posted in Lakeside and tagged Budget, Full Time Budget, Full-Time RVer Budget. Bookmark the permalink. Not too bad at all! We are starting a new budget next week when we start our Alaska adventure. We saved up and are allotting $15,000 on top of our normal budget for the summer. It will be interesting to see how it goes. I see you went over in your “gifts” category and bought me something disguising as something for your nieces. That is awfully nice of you, you can give it to me when we see you this summer! For travel days – we always keep granola bars, yogurt, trail mix, and fruit on hand, which helps keep us away from fast food on the road. Not only do I want to stay away from a budget perspective, but also a calorie one. Yikes. Can you break down that $440 per month for cell/internet/TV and expand on what service(s) you currently have? We haven’t gone full time yet, but I’m trying to figure out a budget, and I certainly don’t have that much budgeted. I know everyone’s needs are different, but am I being unrealistic in only budgeting $200/mo for that? As a couple, I’m hoping for one fully enhanced smart phone, 1 cheapie phone (minimal services), not that much into TV, but will want decent internet access (was hoping a mifi would suffice most of the time – don’t need internet for work)….. thanks! We are definitely on the high side of data because Lee’s work requires it and we download/stream most of our TV. We have a double data ATT plan and get 80gb for the price of 40 at $340 a month including one smart phone which is paid for. We have a second phone for Verizon with 1 gB data used for areas where there is no ATT which is no paid for at $62 month. I would absolutely recommend looking at Technomadias information to determine what your costs will be. There is a ton of variation in this category depending on so many factors, but we are absolutely on the high side. I will say thoug that if you are planning on relying on wifi think twice, since we rarely find good wifi anywhere we go. Be realistic about what you will need and buy a little over that since when you go over (which we have done three times in 1-1/2 years) it costs $15 a gig …ugly. Totally agree…so much easier to find cheap campgrounds out west. Lee’s sewer hose storage is really neat. I may go that route, as I’m currently coiling them in the bed of the truck. He loves the. I have the DIY page written but need hi to add the details to publish!! !